No discussion of Cleveland history and preservation would be complete without mentioning the debacle over MMPI’s new -- and unexpected -- proposal to build the Medical Mart north of Mall C.
This is not an issue that Cleveland preservationists are taking lightly. In her letter to the editor in the November 22 Plain Dealer, Cleveland Restoration Society director Kathleen Crowther made it clear that the view of Lake Erie visible from Mall C has become an essential part of the Cleveland skyline, and that perhaps we should use existing vacant properties before building new ones. And Steven Litt’s story in today’s PD says it all: “MMPI plan for medical mart may be best for the company, but not the best for Cleveland." 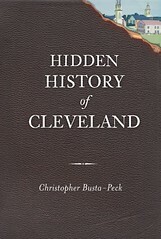 The editors at Cleveland Area History can hardly agree more. We are puzzled by how MMPI could apparently have failed to budget for extensive upgrades to the 87-year-old Public Auditorium’s plumbing, mechanical, and electrical systems. Or how they could be surprised that people might get mad about the new proposal: like Councilman Mike Polensek, we are suspicious that MMPI’s sudden abandonment of Public Auditorium amounts to little more than a bait-and-switch. Perhaps most of all, we are chagrined (but not surprised) at the latest installment in what might be Cleveland’s greatest talent: misallocating public money toward the questionable panacea of monument-building. Convention centers simply don’t deliver the economic benefits that their proponents endlessly tout. We can’t help but wish that the $333,333 a month that Cuyahoga County taxpayers are shelling out to MMPI would go toward our numerous struggling cultural institutions instead. Some will argue that we have to at least try to bring business to Cleveland. We agree. Conventions, however, are not the means to that end - there are plenty of cities with great convention centers, and there doesn't seem to be the demand for another. Further, we simply don't have the climate to make for a desirable convention site. The worst part of this whole mess is the site. The Mall is the most significant green space in downtown Cleveland. Putting the center north of Mall C would permanently mar the landscape. It's one thing for us to throw away money, it's another to throw away one of the most valuable pieces of public real estate.